Q is for Quincy, M.E. Quincy, M.E. (also called Quincy) is an American television series from Universal Studios that aired from October 3, 1976, to September 5, 1983, on NBC. It stars Jack Klugman in the title role, a Los Angeles County medical examiner. The first half of the first season of Quincy was broadcast as 90-minute telefilms as part of the NBC Sunday Mystery Movie rotation in the fall of 1976 alongside Columbo, McCloud, and McMillan (formerly McMillan & Wife). The series proved popular enough that midway through the 1976–1977 season, Quincy was spun off into its own weekly one-hour series. The Mystery Movie format was discontinued in the spring of 1977. The series starred Jack Klugman as Dr. Quincy, a strong-willed, very principled Medical Examiner (forensic pathologist) for the Los Angeles County Coroner’s Office, working to ascertain facts about and reasons for possible suspicious deaths. While many detective series had depicted rudimentary physical evidence analysis such as fingerprints and bullet comparisons, Quincy M.E. was the first to regularly present the in-depth forensic investigations which would be the hallmark of later detective shows such as CSI: Crime Scene Investigation and its spin-offs, NCIS, Diagnosis Murder, Crossing Jordan, etc. Quantum Leap is an American science fiction television series that originally aired on NBC for five seasons, from March 1989 through May 1993. Created by Donald P. Bellisario, it starred Scott Bakula as Dr. Sam Beckett, a physicist who leaps through spacetime during an experiment in time travel, by temporarily taking the place of other people in order to correct historical mistakes. Dean Stockwell co-stars as Admiral Al Calavicci, Sam’s womanizing, cigar-smoking companion and best friend, who appears to him as a hologram. The main premise for Quantum Leap was inspired by such movies as Heaven Can Wait, and Here Comes Mr. Jordan. Series creator Donald P. Bellisario saw its concept as a way of developing an original anthology series, as anthologies were unpopular with the networks. Quantum Leap follows the narrative of Dr. Sam Beckett (Scott Bakula), a brilliant scientist that has become stuck in his past as a result of a failed time travel experiment gone wrong, and his attempts to return to his present, the late 20th century, by altering events in the past for the better, with the aid of a hologram of his friend Admiral Al Calavicci (Dean Stockwell), monitoring him from Sam’s present. In the series premiere, Sam has theorized the ability to travel in one’s own lifetime, and is the lead of the government-funded Project Quantum Leap, operating from a secret laboratory in the southwestern United States; Al oversees the project for the government. When Al learns that funding for the project is threatened of being pulled because no demonstrable results have come from the project, Sam takes it upon himself to step into the Quantum Leap Accelerator to prove the project works, and is sent into the past. When Sam gains consciousnesses, he finds himself suffering from partial amnesia, and more surprised to find that his appearance to others, including what he sees in the mirror, is not his own face. He finds that Al has come to his aid, as a hologram that only Sam can see and hear as it is tuned to his brainwaves. Al, working with the Project’s supercomputer with the artificial intelligence Ziggy (voiced by Deborah Pratt), determines that Sam must alter an event in the current period he is in as to re-engage the Quantum Leap process and return home. Al helps Sam overcome some facets of his “swiss-cheese memory” and provides information on the history as it originally happened, and Sam is able to successfully change history. Sam leaps out, only to find himself in the life of someone else in a different period of time. Episodes in the series subsequently follow Sam’s reaction to this leap (typically ending the cold open with him uttering “Oh, boy!” on discovering his situation), and then working with Al and Ziggy to figure out Sam’s identity, and who he is likely needs to help as to “set right what once went wrong” and to trigger the next leap, hoping that it will return him home. An episode typically ended showing the first few moments of Sam’s next leap that is repeated in the following episode’s cold open. Though initially Sam’s leaping is believed by Al and the others on the Quantum Leap team to be random, the characters come to believe in later seasons that someone or something is controlling Sam’s leaping, and this is a central focus of the show’s finale episode, “Mirror Image”. When Sam leaps, his body is physically present in the past, though appears to others as the person he leaped into. In one case, after leaping into a Vietnam veteran that had lost both legs, Sam could still walk normally but appeared to others as if he was floating. Sam’s body and mind may become jumbled with those he has leaped into. In one situation, he leaped into a women near the end of her pregnancy and felt her birth pains, while in another episode he had leaped into the body of Lee Harvey Oswald and felt the intensity to assassinate John F. Kennedy despite knowing it was the wrong thing to do. Similarly, the person that Sam has leaped into is brought into the future, where they appear as Sam to the others; they are normally kept in an isolated Waiting Room to prevent them learning anything about the future, and they return to their own time when Sam leaps. In most of Sam’s leaps, the changes he makes are small on the grand scale, such as saving the life of a person that might otherwise have died, or helping making someone’s life better. Selected episodes have shown more dramatic effects of his time travels. In one episode, Sam’s actions ultimately lead to Al’s death prior to the Project, and Sam finds himself suddenly aided by a new hologram, “Edward St. John V” (played by Roddy McDowall), and must work to prevent Al’s death. In another episode, where again the Project’s funding is threatened, Sam helps a young woman successfully pass the bar; this causes her in the future to become one of the Congress members that oversee the Project who immediately restores its funding. In the forementioned episode involving Lee Harvey Oswald, while Sam and Al are not able to prevent the assassination of Kennedy, Sam’s actions prevent Oswald from making a second shot that had killed Jacqueline Kennedy in that original fictional history. Because of the time travel aspect, many episodes allude to famous people or incidents indirectly, such as Sam suggesting to young Donald Trump that New York real estate would be valuable in the future, suggesting the lyrics of “Peggy Sue” to a teenaged Buddy Holly, showing young Michael Jackson his signature moonwalk dance for the first time, giving Dr. Henry Heimlich the idea for his namesake maneuver by saving him from choking and setting in place actions that lead to the discovery of the Watergate scandal. Two notable episodes place Sam directly at the center of significant historical events, one being the forementioned leap into Oswald. In “Goodbye Norma Jean”, Sam appears as Marilyn Monroe’s bodyguard, who saves her life and convinces Marilyn to remain alive for her starring role in The Misfits. Other episodes explore the past of the main characters, like Sam saving his brother from being killed in the Vietnam War, and saving Al’s marriage to Beth. In the final episode, “Mirror Image”, Sam leaps through spacetime as himself (without replacing another person), arriving at the exact time of his birth, where he meets a mysterious barkeep (Bruce McGill, who also appeared in the first episode in a different role), who is aware of Sam’s situation, and assures him that he himself controls the very nature and destinations of his leaps by his own choice (“to make the world a better place”), and that Sam is always able to return home at any time he truly wants to. In the final episode’s epilogue, Sam is shown to leap back again to visit Al’s wife Beth as himself again, assuring her that her husband (who was a prisoner of war at the time) will return home to her; this results in Al and Beth remaining happily married in the future, while Sam opts to continue leaping, never returning home. Regarding the theme song: The theme for the series was written by Mike Post. It was later re-arranged for the fifth season, except for the series finale episode, which featured the original theme music. Scores for the episodes were composed by Post and Velton Ray Bunch. A soundtrack album was first released in 1993, titled “Music from the Television Series Quantum Leap”, dedicated to John Anderson, who played Pat Knight in “The Last Gunfighter.” It was released by GNP Crescendo on CD and cassette tape. Did you ever watch Quincy or Quantum Leap? Are there any other Q shows? What are your favorite TV shows, past and present? 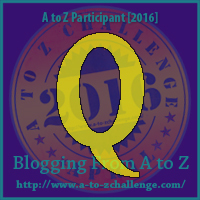 This entry was posted in Posts and tagged A-Z Blogging Challenge, Classic TV shows, M.E., Quantum Leap, Quincy, television by greyzoned/angelsbark. Bookmark the permalink. I loved both of these shows and watched them both all of the time. Great Television right there! It sure was!! Thanks for coming by Mary. Been thinking about you… Hope all is well. I absolutely knew Quincy would show up for Q and Quantum Leap is a perfect choice too 🙂 Quatermass is the other one that leaps to mind as being a classic. In Quincy I used to love watching him get so worked up about everything 🙂 Used to watch Quantum Leap religiously every week when it originally aired. Yeah, Q was a tough letter. Not many choices for sure. But Quincy and Quantum Leap are both really good shows. Don’t know Quartermass. I do recall seeing Quincy on TV, but I don’t recall watching it very often. But Quantum Leap? I love that show. It’s one of the few I have written fan-fiction for. Lol. As first drafts usually are! That’s really awesome. Sounds complex. And good! My comment today won’t be as meaty. It will be M.E.aty because Quincy, M.E. is the only Q series I watched. 🙂 Throughout the 1970s I worked at an NBC affiliate station and one of my functions was as a booth announcer doing voice-overs for commercials and promos. These included Quincy and the other scripted dramatic series in NBC’s “wheel” format showcased as The NBC Sunday Mystery Movie and The NBC Wednesday Mystery Movie. The rotation of NBC shows broadcast throughout the decade under that umbrella included McCloud, Columbo, McMillan & Wife, Banacek, Cool Million, Madigan, Faraday & Company, Tenafly, The Snoop Sisters, Amy Prentiss, McCoy, Lanigan’s Rabbi and Quincy. Anita Gillette, a familiar face on popular TV game shows that included What’s My Line? and The Match Game, played Quincy’s wives throughout most of the series’ run. I admired Jack Klugman as an actor and enjoyed Quincy because I was fascinated by the process of using forensic science to solve murder cases. In recent years Mrs. Shady and I have been reviewing the Quincy series on Netflix. How well I remember the 90 minute movies and shows on the Wednesday nights and Sunday nights! I remember most of those but am unfamiliar with Cool Million, Madigan sounds familiar, Don’t know Faraday & Co, Tenafly, The Snoop Sisters, Amy Prentiss or Lanigan’s Rabbi!! Wow, where was I that I missed all these?? Haha I wrote about quantum leap too! Loved when leaped as Elvis! i tried to find that clip to include in my post but couldn’t find it. I loved Quincy…Walter Matthau so different from his role in The Odd couple. Quantam Leap is an old favourite too…I love the idea of time travel. Never watched Quincy, but Quantum Leap–yes, yes, yes! It’s one of my favorite shows of all time. This is one of the few shows that I’ve purchased the complete DVD set for. I’ve been thinking recently that I need to go back and watch the series from beginning to end again since it’s been a number of years since I’d done so. I absolutely loved Quantum Leap. I forgot all about that!!! Yes Quincy and Quantum Leap were two of my favorites. Loved Jack Klugman and definitely had a crush on Scott Bacula! I love Scott Bakula on NCIS New Orleans too! I watched a lot of Quantum Leap at some point in my life – but I don’t think I would have ever been able to associate the music with its theme, even though I remember the opening credits really well. Quincy was my all time favorite show of this time period. I used to dream of becoming a medical examiner, LOL. Happy to just be a nurse!! I don’t think I knew you were a nurse Paula! That’s very cool. Do you work in a hospital or for a Doctor’s office? What do you like best about being a nurse? I quit working three years ago when Richard had a stroke. And then I took care of him until he died. After that I was no longer interested in being a caregiver. So I am now retired. I loved taking care of others. Especially the elderly. The have so much to offer! I remember Quincy, but I don’t think I watched it more than once or twice. We loved Quantum Leap. Some images from that show stay with me, especially the photo of Al when he is taken prisoner in Vietnam. I found the Lee Harvey Oswald episode quite moving. Now I want to watch Quantum Leap all over again. I bet my kids would join me. I LOVED Quincy! One of my favorite shows. I remember these two series. I think Quantum Leap was aired on Thursdays here in Malaysia. Not 100 per cent sure, though. Thanks for stopping by Aneeta! Loved both these shows. Thank you so much for the synopsis of the finale as I had gone overseas when this aired and never got to see it, and I’d never looked it up to see what happened. I always suspected that if he had the choice the gorgeous Sam would choose to keep leaping and helping people. I’m so glad you liked the synopsis. I was afraid it was too long so I’m really happy that it was beneficial to someone! Thanks for letting me know Pamela! Strike outs on both shows; I never watched either one!